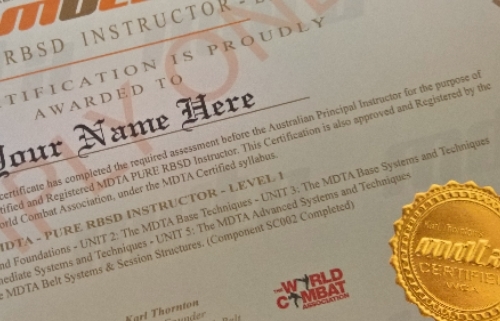 By becoming an MDTA Instructor you can offer instruction in different areas of self preservation and self protection. From non-physical type training such as situational awareness, through to full physcial use of force training depending on your requirements. All training is based on MDTA systems that are internationally recognised and utlized for self-defence training World Wide. There are different options for becoming an MDTA Instructor. The realities of anger, aggression and violence. How to understand and deal with fear & adrenaline. Self-defence techniques best suited to the individual. Building an individuals power level. MDTA Female Only RBSD Self Defence Instructor. Note: The following areas are more concise and directed towards female self defence principles. Optimal Situational Awareness (OSA) Instructor. Working within an organisations Policies & Procedures when training in self defence. Training staff, employees or consultants with the needed skills to deal with behaviours of concern. From dealing with individuals where anger, aggression and or violence may be involved. Using applicable self preservation and self protection skills in their working environments. Law Enforcement & Security Instructor. Training Police and Security personnel in the area of high resistance defensive tactics training. Covering unarmed defensive tactics, arrest and control, handcuffs, batons, search-and-seizure and weapons training.